Preston McGinnis (No. 2, left) flies as Highland Park's Justin Walker (No. 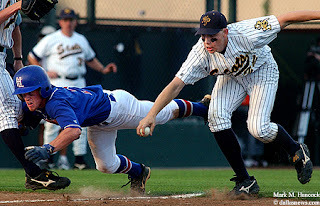 25, right) tries to regain balance after a run down near home plate during a Region II semi-finals baseball playoff at Allen High School in Allen on Saturday, May 24, 2003. Highland Park won this game 3-2 and tied the series at 1-1. 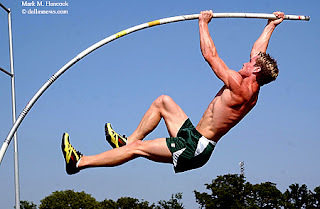 Birdville High School senior Toby Zelt practices at the school in North Richland Hills for the state pole vaulting competition on Wednesday, May 7, 2003.